The Benefits of Quitting Smoking are Huge - Start Feeling Fantastic Today! The Health Benefits of Quitting Smoking are Huge! The benefits of quitting smoking are pretty obvious but still most people think it is just about avoiding lung cancer. There are so many other benefits that are not so obvious. Just feeling fitter, being able to breathe easier, smelling nicer - these are just some of the benefits. When I was a smoker I was always reading about how my health would improve within hours, days and weeks of quitting but I still don't think I was fully taking it all in. Add to that the fact that I am a nurse and you would think I would have been sitting up and taking notice more than anyone else. Actually I am amazed at the amount of people in the health profession that do smoke. Many of my work colleagues are constantly nipping out for a cigarette when they really should know better! They know more than anyone else the benefits of quitting smoking. We are surrounded by posters telling us the benefits of quitting smoking but obviously no one takes any notice. You Can Feel the Benefits! The thing is - it was not until I actually did quit and started to feel the benefits of giving up smoking that I realised that it was not all just hype. It is a fact that you will start to feel better almost immediately but the problem is that you are suffering so much from nicotine withdrawal that you don't recognise any of the wonderful changes that are taking place. I think one of the most noticeable changes for me was that I wasn't constantly clearing my throat. One of the reasons I so desperately wanted to give up smoking was that I had developed a cough and whenever I laughed my laugh ended in a coughing fit. It was extremely annoying and a bit disgusting! When I finally quit it was the thing I noticed the most and now seven years later I still love the fact that I don't have a cough and when I laugh I just laugh. Even if you have decided to use a nicotine replacement therapy such as nicotine patches or another form of help to quit smoking like Zyban, Champix, or the electronic cigarette you will still be enjoying most of the health benefits associated with quitting. Here is a list of some of the benefits you will enjoy! After 12 hours almost all the nicotine is out of your system - that's great but this is the one that is going to be the big hurdle because now the withdrawal symptoms begin and the anxiety sets in. After 24 hours the level of carbon monoxide in your blood has dropped - this is noticeable by the fact that you can actually start to feel the oxygen entering your blood stream and doing you good! I felt like when I took a breath I actually got some oxygen which felt like fresh air. After 5 days most of the 599 chemicals that you were inhaling along with the nicotine have left your system (unfortunately the damage they caused stays for a while). This represents a huge health benefit. The interesting thing about this phase is that it depends on how your body dealt with all those other products. Some people have their own mini withdrawals to some of these chemicals - we are all different and I have to admit that I did feel ill at this point and that made the whole process harder. Everything Smells and Tastes Great! Within days your sense of smell and taste improves - the down side to this is that now that everything tastes so good you just want to eat! 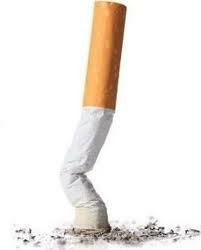 Anyone who has quit smoking without gaining weight is a walking miracle! I was told I would put on 3-5 kilos but I ended up putting on 10. It was my own fault because I turned to peanut M & M's by the truckload to get me through the tough times - big mistake! Don't do the same as me - plan ahead and find some healthier snacks to feast on because trying to lose 10 kilos was no easy task. Don't get too worried about the weight gain because the benefits of quitting smoking are always going to over shadow any small amount of weight you put on. On a personal note I would also like to add that because my husband is a non-smoker I now have the added benefit that I love kissing him - I did not realise how much I avoided kissing him because of my awful breath. On top of that I really did see the difference in my skin (and still do) after only a few months of quitting. Sometimes it is the smaller benefits of quitting smoking that get overlooked. Within a month your blood pressure returns to normal - it always annoyed me that my non-smoking husband had lower blood pressure than me but now we are the same. Circulation has also improved by now. Within 2 months your lungs will no longer produce the extra phlegm - so true! That was a major break through for me - I love not having a phlegmy cough and having to constantly clear my throat. I also no longer suffered from shortness of breath at this point. After 12 months your risk of dying from heart disease is halfway to that of a non-smoker and after 15 years it is the same as someone who never smoked. Aside from the cancers that are attributable to smoking there are also the many lung diseases you could end up with. Stopping smoking reduces the incidence and progression of the many lung diseases including emphysema. Your Lungs Can Start Repairing Themselves Now! Another way to consider the benefits of quitting smoking is to think about your age NOW and the benefits to quitting smoking NOW. My father gave up smoking at the age of 70 because his doctor told him he had to. Don't leave it until then. My dear Dad has emphysema and it is not nice to see him struggling to breathe all the time. He knew the damage he was doing and he was well aware of what the benefits of quitting smoking would be. If you quit before 35 your body has a chance to heal and you will have the same life expectancy as someone who never smoked. If you quit before the age of 50 (that's me!) then the risk of dying within the next 15 years is halved. I have only discussed health benefits on this page because you already know that one of the benefits of quitting smoking is all the lovely money you will save!